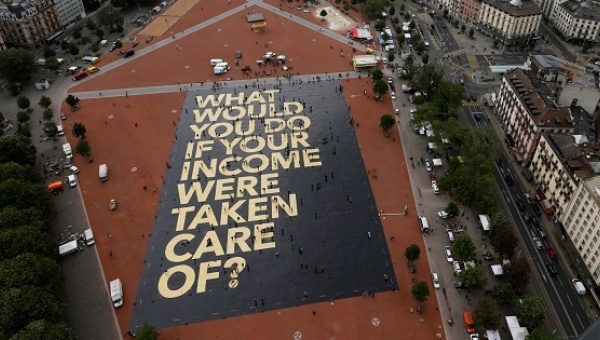 (P1) Swiss voters rejected a plan to introduce a guaranteed monthly income for all citizens. Almost 77 percent of voters said no. The idea was for a minimum salary of around $2,500 for those who have been a citizen for five years, whether they worked or not. Supporters said it was necessary to replace Switzerland’s social welfare system to fight poverty and inequality. It would also give more money to people who earned below the minimum wage. Do you agree or disagree with a guaranteed monthly for all citizens? Why? Does your country have a social welfare system? Tell about it. Why do you think people live in poverty? What percentage of the voters said no to the basic income proposal? What is the name of the group for the basic income proposal?